Peter DeLaurier, Alda Cortese, Janis Dardaris, Marcia Saunders, and Carla Belver in Morning’s at Seven, at People’s Light in Malvern. American theater teems with characters worth despising, from such losers as Willy Loman and Tom Wingfield to such thugs as Billy Bigelow and Stanley Kowalski. Paul Osborn's Morning's at Seven, now in a delightfully charming production at People's Light, could add a few entries to the list. Osborn's 1938 play opens on the daily routines of Theodore and Cora Swanson (Peter DeLaurier and Marcia Saunders), married nearly 50 years – and living almost all of them with Cora's sister Aaronetta (the brilliant Janis Dardaris). Right next door resides their third sister, Ida (Alda Cortese), her husband, Carl (Stephen Novelli), and their 40-year-old bachelor son, Homer (Pete Pryor). Carl despairs over his life choices, Aaronetta pines for a decades-old unrequited love, and Homer can't let go of his mother's metaphorical apron. Fourth sister, Esther (Carla Belver), lives up the street with hubby David (Graham Smith), who derides his gossipy, insular extended family as "morons." "Fences make good neighbors" (as Osborn's lifelong friend Robert Frost once penned), but no fence – physical or psychological – segregates the intertwined sufferings of these family members. Peter DeLaurier, Marcia Saunders (center), and Janis Dardaris in “Morning’s at Seven” at People’s Light in Malvern. When Homer brings home his fiancée of seven years, Myrtle (Teri Lamm), to finally meet the family, her visit serves as a catalyst for these near-septuagenarians' finally coming to terms with the frustrated longings and unfulfilled desires that have plagued them for the majority of their adult lives. Put like that, it sounds boring and devoid of real consequence, and without Osborn's folksy humor and the magnificent performances of this ensemble, the play probably would have put a scowling face atop a pair of folded arms for the bulk of my evening. Instead, I laughed heartily at the futility and smiled bright-eyed at the simple charm these actors evoked. Osborn's play blends story elements and the themes of Chekhov's Uncle Vanya (minus the earnest striving) and the hokey existentialism of Thornton Wilder's Our Town. Abigail Adams' direction layers thick humor over the disappointment of denied ambition. 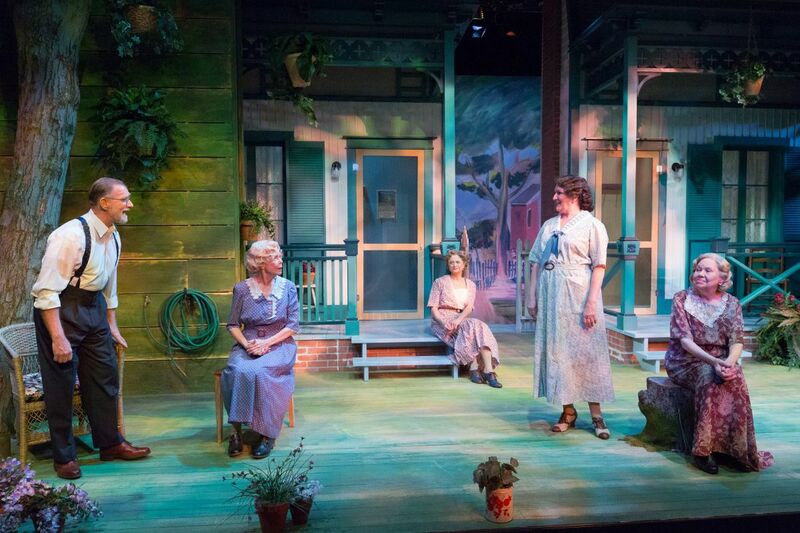 Dennis Parichy's lighting – setting up a simple summer day and night – ennobles even lifelong despair with the kind of soft, sympathetic tones meant for thwarted youth. Pryor and Novelli excel in their depictions of a father and son sharing similar strategies to stave off anguish. Lamm endears, despite Osborn's lines that require her to burst with trite generalities and platitudes. I imagine that Osborn, a Midwesterner like these characters, intends to evoke sympathy and perhaps shared feelings. This cast might have elicited that from some on Saturday's opening. For me, it was simple enjoyment. Runs through Feb. 12 at People's Light, 39 Conestoga Rd., Malvern, Pa.